A colour photograph of the Jabez Lynde House being moved from 960 Dundas Street West to Cullen Gardens (300 Taunton Road West). View is of the house moving down the street. There are three people sitting on the roof. 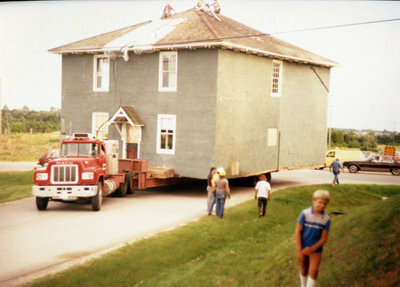 Relocation of the Jabez Lynde House, August 1986, Unknown Photographer. Whitby Archives A2013_030_010.